You’ve heard of stroller envy, well now you will hear about diaper changing table envy. I first used this diaper changing table after my mom had already bought gorgeous baby furniture for the entire nursery, including a dresser/diaper changing table. 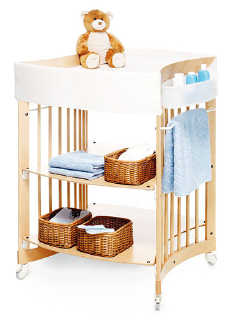 I love the set, they are beautiful traditional pieces but after using the Stokke Care table, I realized that even changing tables could be improved upon. The most important feature of this table is the adjustable height. I am not tall at 5’6″ but most changing tables are low in order to accommodate all sizes of mommies and daddies. The need to bend, even slightly, to change diapers means stress on the back (and I have a bad back so I am especially sensitive to any bad postures) and after changing a thousand diapers in the first year of your child’s life, that adds up to a lot of back aches. Another unique feature is the positioning of the baby on the table, instead of laying with his/her side to you, he/she is head to toe, meaning the bum is directly in front of you for better and easier access to the subject at hand. 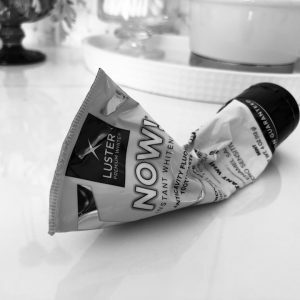 No more twisting and turning to make sure you’ve properly cleaned in all the nooks and folds. There are more than adequate baskets hooked on the sides for all your accouterments and the bottom shelves are perfect for storage and displaying of stuffed animals. The best part though is that this whole thing transforms into a desk when your baby is finally potty trained!! Stokke has a high chair that transforms into a regular chair for the desk (which is pure genius, I will do a separate review on that). I, however, will never be able to make use of my dresser/changing table past elementary school and that is pushing it. I picked traditional furniture because I am a traditionalist and the rest of my house is such, but the functionality of this table is enough for me to switch gears on style, just for the baby room. Too bad I will never have that chance, but for those of you who have not committed, I would highly recommend giving this a chance. 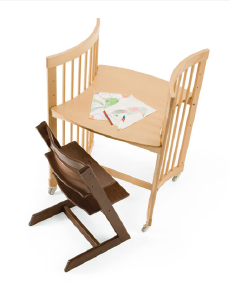 $450 at Giggle and comes in natural (shown), walnut or white. Stokke also has an oval crib to match.